Mutual Information between two clusterings. 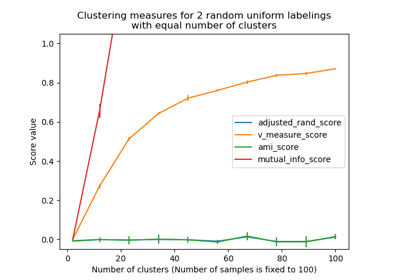 This metric is independent of the absolute values of the labels: a permutation of the class or cluster label values won’t change the score value in any way. This metric is furthermore symmetric: switching label_true with label_pred will return the same score value. This can be useful to measure the agreement of two independent label assignments strategies on the same dataset when the real ground truth is not known. A contingency matrix given by the contingency_matrix function. If value is None, it will be computed, otherwise the given value is used, with labels_true and labels_pred ignored.